For modifications and adjustments see Constant CR, JSES 2008;17:355. Hudak PL, Am J Ind Med 1996;29:602-608. Jensen KU, Not all Rowe scores are the same! 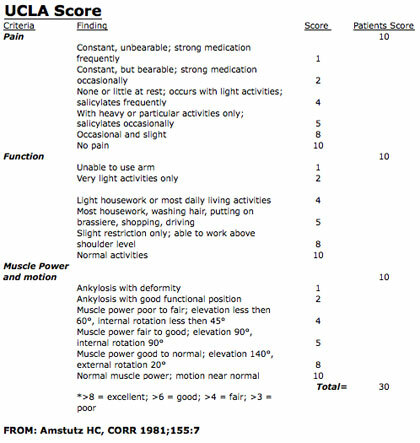 Which Rowe score do you use? JSES 2009;18:511. Rowe CR. 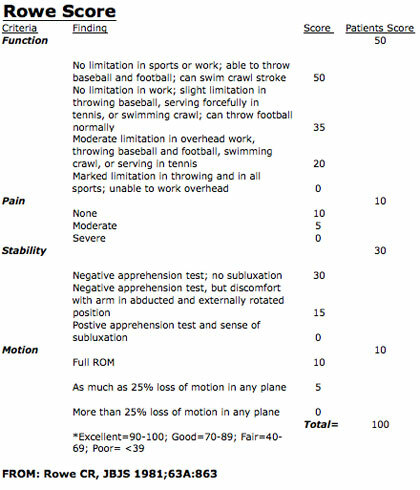 Evaluation of the shoulder. In: Rowe CR, ed. The Shoulder. New York, NY: Churchill Livingstone; 1988:631-637. Rowe CR, The Bankart procedure: a longterm end-result study.JBJS. 1978;60A:1-16. Rowe CR, Chronic unreduced dislocations of the shoulder.JBJS 1982;64A:494-505. Rowe CR, Recurrent transient subluxation of the shoulder. JBJS 1981;63A:863-872.